Gigabyte’s slide has officially confirmed that AMD is preparing a refresh of their FX Processors which would be clocked at 5 GHz. 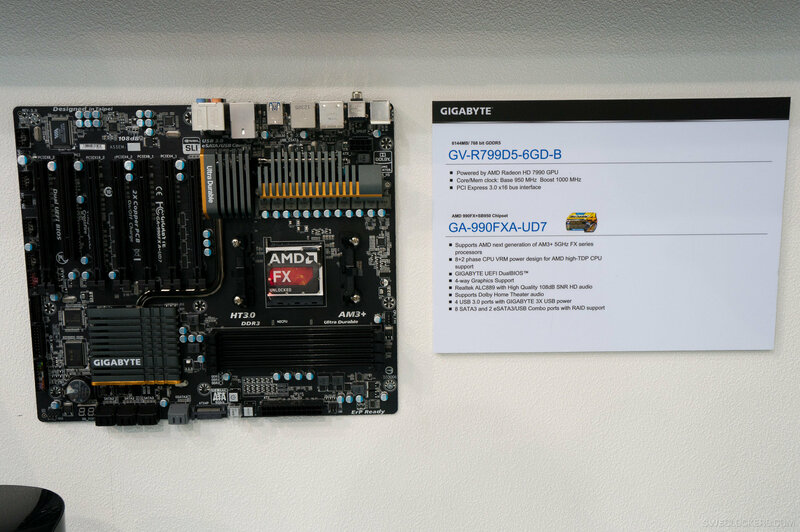 Over the past few week, we have been hearing rumors about AMD releasing either an FX-Centurion or FX-9000 chip that would be clocked at 5 GHz but now a slide showcasing GIgabyte’s GA-990FX-UD7 motherboard has revealed that these processors are officially headed for the consumer market. According to previous reports, we already know two of these upcoming FX Processors – The FX-9000 and FX-8770. Although the codenames are not confirmed yet but the details we available on these two chips are quite spicy for sure. Both processors would be based on the x86 Piledriver architecture which may not spark interest among the PC crowd but its not the architecture that’s astonishing about the new processors, its their clock speeds. AMD’s FX-9000 which is a FX CPU refresh is aiming to push the clock speeds at 4.8 GHz base and 5.0 GHz Turbo core clock which is a record native frequency for any processor ever released. The FX-9000 still has 8 Piledriver modules and 8 MB of L3 cache, its compatible with the AM3+ socket and will support 1866 MHz+ memory. Another change is the TDP, the FX-9000 is probably gonna get a trophy for its massive 220W TDP which compared to the SB-E Intel processors is quiet high and would require some massive cooling solutions just to let the heat off. The second processor that got leaked is the FX-8770, again a similar designed chip which would replace the FX-8350 and would have 8 Cores and a TDP of 220W. Its clock frequencies are not known but i suppose near 5 GHz for this chip is pretty much expected. While AMD prepares their FX Processors refresh, it should also be noted that the company plans to launch their new Richland APUs tomorrow at 12:00 EDT. So make sure you are up at that time to witness the launch of AMD’s third generation of accelerated processing units. According to Sweclockers, both processors are supposed to make debut at E3 2013 around 11-13th June 2013. Could possibly be AMD’s partnership with another game developer like they showcased the HD 7990 running Battlefield 4 and later announced partnership with EA as their official hardware partner.